The views that the West has today of Russia are outdated and need to be corrected. But it will be nearly impossible to correct them if Russia itself does not stop believing in its own propaganda and does not define its long-term interests. In my years of living in the U.S. I have accustomed myself to the difference between what Americans think of Russia and how Russians themselves imagine the opinion that Americans have of Russia. Bears wandering in the cities - this is a particularly Russian stereotype of how Russia is seen in America. In reality, Americans have more esteem for Russia. However, obviously the idea of the taiga bear that Vladimir Putin has been actively using to describe Russia in his discussions lately does not make Russia very likeable abroad. Western political thought on Russia is divided into two groups. The first states that Putin is transforming Russia into an authoritarian country with a weak civil society. The numerous adherents of this position believe that Putin is the principal political architect of today's Russia. Moreover, today's Russia will not survive the departure of Putin as it did with the exit of many predecessors, from Ivan the Terrible to Boris Yeltsin. "Their" Russias quickly disappeared, and the new leader manually worked the country's political levers. In particular, this is the view that the current U.S. administration adheres to. The second view states that, according to Russian history, Putin is a typical leader. His objective is not the realization of his program (which he does not have), but rather the preservation of the government status quo and Russia's development strategy, which was established many centuries ago. In this sense, then, there is no such thing as "Putin's Russia;" there is "Russian Putin," who is a mere product of national political culture, institutions and traditions. This is the view that U.S. policy had in the first decade after the collapse of the USSR. Of course, I am simplifying things, I know. These two positions are obviously not so linear. The West is often accused, and rightly so, of preferring to deal not with the current Russia but with a "virtual Russia," one concocted in the offices of Washington's research centers. The We can criticize experts for the degree of inadequacy of their views, but in the end the world today needs a more advanced understanding of Russia. At the same time, in order to be understood, Russia must first understand itself. First of all, it must understand and define its long-term national priorities. The perplexities that the world has concerning Russia can thus be understood, especially, for example, when the acquisition of Crimea is presented as a cornerstone of Russian statehood, yet in reality only a year ago it was not even mentioned, neither by the president, nor by Russia's military, nor by diplomats, nor by experts. It would also be naïve to think that a country that in the last 100 years has experienced several collapses would suddenly be viewed by the world community as a custodian of traditional values. One's national reputation is developed over a long period of time and as a foundation must have something real, not the belief in its own propaganda. Finally, it is not right to equate competition between countries to confrontation and hostility between them, which often happens in Russia. 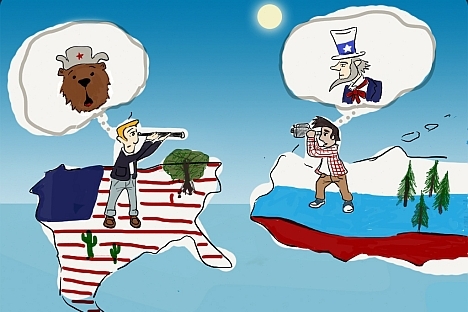 Obviously, Russia wishes to be a strong competitor for the U.S. and for the West in general. Washington understands this and accepts it. But it is also natural that the West sees Russia as a competitor and acts accordingly. Today, obviously, the time has come for the West to make substantial corrections to its long-term attitude toward Russia. In this sense, the current sanctions, which have limited access to Russia for everyone in the West, have only complicated the situation. Driving Russia to the world’s periphery because of a disagreement with a part of its foreign policy is not very farsighted. But a fundamental change in the West's view of Russia is impossible without a radical correction of Russia's long-term attitude toward the West. The current political disagreements have led to an awful vulgarization of Western civilization and values on the part of Russia. Russia must also find a response to "Putin's Russia" or "Russian Putin." For how long does the biggest country in the world wish to consider itself a bear? The author is President of the Center on Global Interests, a private research organization dedicated to analysis of U.S.-Russian and post-Soviet global affairs, based in Washington, D.C.
Read more: Russian whataboutism vs. U.S. moralism: Is attack the best form of defense?